Can a film change the way you shop for clothes? ANDREW MORGAN’S documentary ‘The True Cost’ about the impact fast fashion is having on the world was made following the Rana Plaza factory disaster in Dhaka, Bangladesh in 2013. It seeks to show the truth about the global fashion industry, from wider issues surrounding factory worker conditions, to the lesser-known environmental impacts, such as river pollution and soil contamination. Forward five years from the tragedy that saw over 1,000 factory workers killed and there’s been some changes, but not enough. A living wage for garment workers has not been implemented and they are working longer hours than before, as the price of clothing continues to decrease. It was timely then that as all eyes were on the capital for London Fashion Week, Tongues on Fire (UK Asian Film Festival), in association with The Circle (charity) screened the film as a reminder of what really goes into making the clothes most of us wear. 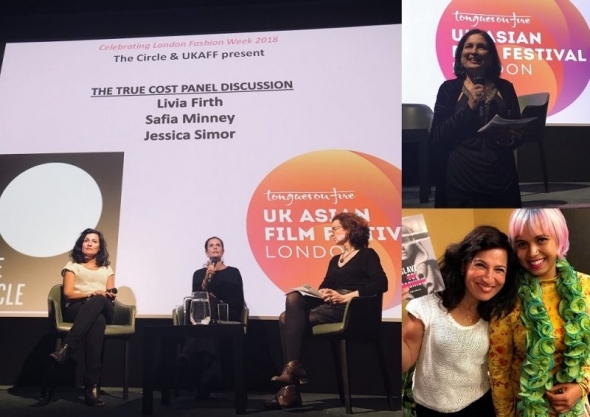 The sold-out screening was attended by influential fashion icons like Jo Wood and included a Q&A with leading ethical fashion ambassadors Safia Minney MBE, Livia Firth and Jessica Simor. Difficult viewing a lot of the time – Morgan travelled to 14 countries to make the film. We hear the stories of garment workers, factory owners, cotton producers, those who work in leather tanneries and footwear manufacturers juxtaposed against footage of fashion bloggers bragging about their cheap clothes hauls, and the mass hysteria of shoppers on Black Friday (massive discounting), trying to get clothes for the cheapest price they can. Much of it seems like a horror story and that’s before you see footage of the dead bodies from Rana Plaza, which increases the uncomfortable nature of the film. One of the documentary’s most shocking revelations is fast fashion isn’t just about the conditions of factory workers who sew the garments, it begins with the production of fibres – the cotton seeds that are sprayed with pesticides so that excessive amounts of cotton can be grown to keep up with demand for cheap clothes. Though 1,000+ workers died at Rana Plaza and through other related garment factory incidents, many more are dying in the textile production stages or suffering from debilitating diseases because of their working conditions. This may be due to the pollution of their water supplies due to the chemicals used in making cotton and preparing leather, or the exposure to breathing in constant fumes. Garment factory owners in the film explain that unless they give clothing brands the cheap prices they demand, they’ll go elsewhere. It seems like a vicious circle until we hear how ethical fashion brands like Safia Minney’s People Tree are changing the mould and proving that it’s possible to have ethical fashion made by people who have good working conditions, are paid fairly, working with organic fabrics, ensuring neither people or planet aren’t harmed in their production. The message brings hope but the company is leagues behind the scale and popularity of the major high-street brands who allow the fast fashion industry to continue to grow. ‘The True Cost’ is a powerful watch with a focus on bringing about change. In the Q&A, Safia Minney talked about the major shift in Western Europe towards veganism in recent years, that if that kind of culture change is possible in such a short space of time, stopping the fast fashion industry is equally as obtainable. The screening at the Regent Street Cinema in central London took place on September 14. ‘The True Cost’ is available to watch on Netflix. Cannes Film Festival 2018: Mahira Khan interview with Shay Grewal (Sunny & Shay) – coming soon!